The sky was amazing, the fisheye was crying out to be used, and I thought it was time to brave the 'other' balcony. This is the result -- three bracketed shots combined in Photomatix and processed in LR5. I've now decided a fisheye of my own is a must! I'll be inconsistently online for the next week -- visiting @jyokota in Poland, combining work and some photo fun. Thank you for your wonderful comments and favs for my Bean image yesterday -- it made it to PP which made me feel great. wow, this is amazing! Spinningly cool! Wow, that is astonishing. Beautifully done! Me too...This is just Too Cool! Fisheye and HDR at it's best.The road and traffic give such a strong impression of swirl that the sky is forced to support the implied movement, hence the cityscape is surrounded by movement. A great example of the mind filling the gaps on the sides of the image because of the strong vectors at the bottom of the frame. Wonderful. So many colours, I love the fisheye effect on this one. Another balcony? Good on you for braving it. You must know by now my feelings on balconies. Superb! I love what you have done here. Brilliant and beautiful! Chicago, as see through your lens, seems to be set on an island! Love the fisheye effect here! Beautiful shot. WOW WOW WOW I must get myself a fish eye lens!! This is fabulous!! Well done for braving the balcony again!! Safe journey to Poland and have a great time with Junko - I am sure you will get some wonderful photos to blow our minds!! Huge Fav for this fab shot!! Fabulous Taffy, what a mind bending image, the fish eye is perfect for you, I love this. Fav for sure. Excellent use of the gorgeous sky, the skyline and the streets in the foreground, all of which forms a perfect unity. You are having a ball with this lens. Great shot. This is just amazing. A fantastic lens in the hands of a very talented photographer. That is a great combination. Fave of course. Wow! 'Nuff said! No more words. Incredible picture and perspective. Congratulations on making the Trending Page. Well deserved. Oooh love this. Shall bill you if I end up buying a fish eye! @rachelwithey Heehee!!! Had to laugh as I've been busily pricing them, and Leslie just bought one -- @lesip -- that was reasonable, so I'm waiting to hear from her about how much she likes it -- the only downside is it's manual focus, but it works on DX and FX (cropped and full frame). Superb and certainly catches the hustle and bustle of city life! I can see you're having a wonderful time with your new lens! Oh, I love this! FAV! Totally awesome and love it! Nicely done, you seem to be having a lot of fun with this fish eye...fav. Excellent!! Fisheye arrived today but it's snowing to beat the band outside. Did put it on the camera and it utilizes the full frame . Told a couple shots out the window that looked pretty interesting on the back of the camera . Haven't loaded them on the lap top yet. Lots of snow pics so probably won't may my project today, time will tell. @lesip Big news is that it utilizes full frame. How did you find the manual settings -- any hassle? Oh I can't wait to see your Poland shots, how exciting! This shot is fantastic, so much to see down there. Love that there is some snow around too. Wonderful shot. Looking at all these pictures of yours is making me want to go try out my camera's fish-eye option. Wow - this is fantastic - those colors and the processing are terrific. What a lovely shot. Brilliant processing.Have fun in Poland...my grandparents was from Poland. Looking toward to your photos from there. Hi @lesip . Taffy mentioned that you'd bought a fisheye lens. Can I ask which one you bought and how much you paid? If you'd rather do that by e-mail I can let you have my e-mail address. Taffy - which one have you been using? 60 faves tell their own story - here's one more. 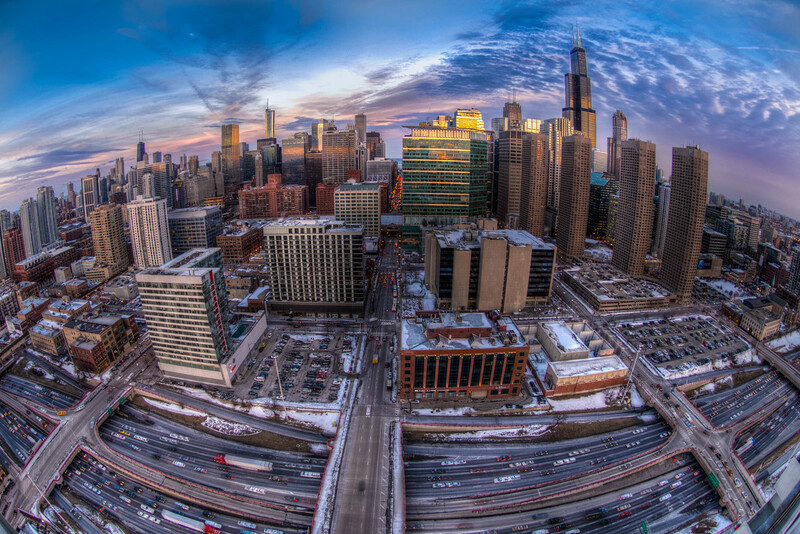 Fantastic fish eye of Chicago! Hi Rachel -- I noticed you use a Canon, so this won't help directly, but the one I've been using is a Nikon DX AF Firsheye Nikkor 10.5mm/f2.8. It's about 3-4' long, fairly lightweight, and for a crop sensor camera. I have no idea of cost, but I always check for a used lens before buying a new one. I usually can save about 30% when I do that. There are some new ones out there for under $400 or even less for a Canon that I saw when I was searching. Have fun! wow that is a marvelous effect of the fish eye!! Love it! have fun in Poland! Just curious at this point, where do you search for used lenses? @bill_fe I've gotten a 50mm from eBay, and a few others from Calumet. I'd just check a reputable camera store -- not a chain. Since lenses don't really wear out, you can save a ton. They will buy back lenses too, but I don't find the pricing very enticing. For example, I have another 50mm that works on the Nikon models up to the D610 (an FX version so it acts as a 70mm on a DX frame) but they will give me so little for it, that I figure someone I know may end up wanting one and I could then give them a great price instead. But for buying, camera stores are a great option. Congrats TT taffy. Well deserved. And no 1 at that! That lens has served you well. Wow, 2 TT's this week! You are on fire. Well done! Congrats on top spot Taffy, love it! Fantastic Taffy the detail is so good and that effect works so well with the subject matter, fav. Congrats on number one for the week! I seem to have missed TT this week and was just browsing and saw you at number one and then again lower down the rankings. Another double Taffy! Well done and so well deserved with these fab fish eye lens shots! fantastic. I love what you have done here. congratulations on TT. Top of the TT! Good for you. Bit late, but a fav nonetheless! Well done on TT x2! Wow! I just gave you your 80th fav! Missed this till now. This is amazing, to say the least. Congrats on the number one, and well deserved, spot on the TT, Taffy. @taffy Thanks Taffy. Is Calumet any good now? It was purchased by the same group that owns Ritz, Wolf, and several more. Congratulations Taffy on another TT finish! Well deserved! @bill_fe It's hard to tell. The 'old' Calumet had a person I worked with throughout. He knew what I did and would occasionally alert me when a lens came in that I was looking for. The 'new' Calumet isn't set up yet in a way that I can tell with much used inventory, but I can see they are doing fairs, etc. to bring it in. And I'm not looking for anything at the moment so am out of touch (except maybe a full-frame fisheye! ).